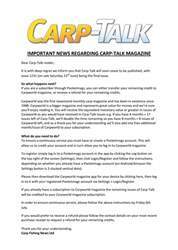 This week’s issue of Carp-Talk (issue 1017) is available to download now! In this week’s magazine, we lead with the story of two fifties caught from Wingham Fisheries in Kent within the space of 40 hours. We have also got news of Steven ‘Oz’ Osborne’s remarkable 100lb brace from Strawberry fields, featuring a 57lb 6oz common and a 43lb mirror known as the Horseshoe. 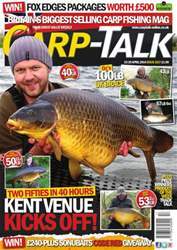 Elsewhere in the mag, Julian Cundiff looks at the common mistakes made by carp anglers, Team Korda talks feature finding, and Wes Coggeshall looks back at a purple patch he hit a few weeks ago. 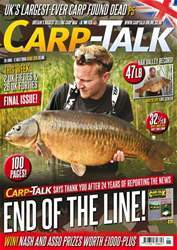 Mark Holmes introduces the concept of bespoke hookbaits in part three of ‘Carp Fishing without a Rod’, and products from Richworth, ESP, Nash and Sticky go under the microscope in ‘Trade Talk’. 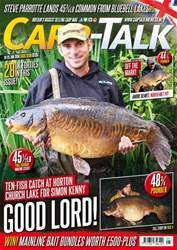 The Fox Mainline Carp Angler of the Year competition continues, the Gardner monthly winner is announced and there are £500 worth of Fox Edges tackle and £240-plus worth of Sonubaits products to give away.